Honda has proven itself as of the most reliable carmakers in the world, with legions of loyal owners who will only buy this particular brand and nothing else. In the U.S., models such as the NSX are marketed under the upscale Acura brand. Honda's rich legacy in developing racing engines has no doubt helped the company create some of the most popular sports cars in the world. 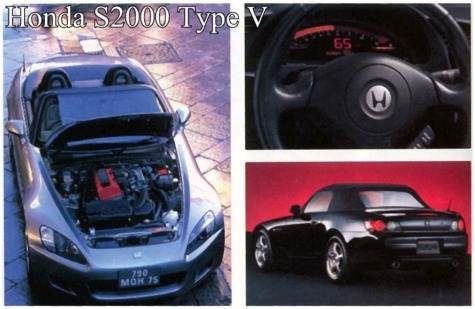 Honda's real open sports S2000, which appeared on April 15, 1999, was followed in July 2000 by a model called the Type V. The Type V is notable in that it is equipped with the world's first variable gear ratio system (VGS). VGS is a system that varies the steering gear ratio depending on the vehicle's speed and the angle of the turn, thus improving the overall steering response at low and intermediate speeds, and also improving the response at large turning angles, thereby maintaining stability at high speeds. This means that it changes from the extremely quick setting of 1.4 turns lock-to-lock to normal 2.4 turns lock-to-lock (although this is still pretty quick), and back depending on the car's speed and the turning. Naturally, when the car's speed is low and the turning angle is large, the settings are made to be quick. There are few obvious differences from the normal model in either the interior or exterior. On the exterior, the only change is the addition of the VGS badging. In the interior, only steering wheel is changed to a custom Type V model. The custom Type V steering wheel is painted silver top and bottom, giving it a sort or "cyber" feel, and its shape is a D-shape like that of a racing car. The other mechanical aspects are identical to the normal S2000, and there are no changes to the engine specs. Only the vehicle weight was increased slightly. The quick steering feel gives you the feeling of a "new handling sports car" just as in the advertising copy. The development concept of "achieving high response and enjoyment with a Formula feeling" has been solidly achieved. From the timid but agile '93 Civic Sir-II to the wild and ferocious Castrol Mugen NSX, Honda has a competitive car for almost every category in the game. Their JGTC NSX's are by far some of the most enjoyable to drive in the game.